First Electronic Chemistry Conference a rousing success. Please note, this is an old printed Newsletter and you can download a scanned PDF of the entire Newsletter with the above link. We have used OCR to digitize these, and there are bound to be OCR errors. Please contact us if you are interested in helping clean this up, and please note, you have access to the original PDF before any OCR work was done. Submissions: General anicles should be sent to editor Brian Pankuch at the above address. We would appreciate both 1) printed copy (hardcopy) and 2) a readable file on a Macintosh or IBM compatible 3 1/2" diskette. We have fewer problems with 3 1/2" diskettes. Submission deadlines: Fall issue- Sept. 25; Spring issue- March 15. For example if you use WordPerfect to make a file named foo send it as foo.WP. FOR OTHER WORD PROCESSORS SEE Aldus PageMaker 4.1. We can read ASCII FILES. RATES: USA 1 year $2.50, two years $4.50: Other coUilU'ies 1 yr $5, two yr $9. Please make a check or money order payable in US funds to Computers in Chemical Education Newsletter. One to three issues are published per year. Consulting Editor Donald Rosenthal, Department of Chemistry, Clarkson University, Potsdam, NY 13676. Send meeting notices, etc., to Don .. ROSEN@CLVM.BITNET. Managing Editor Henry R. Derr, Laramie County Community College, Cheyenne, WY 82007 HDERR@eagles.lcc.whccn .. EDU. Contributing Editors: Send your contribution on specific areas to the appropriate editor. For hardware Queries and Replies. Jim Beatty,IBM and compatibles Chemistry Dept., Ripon College, Ripon, \\·1 54971, BEATTYJ@ACAD.RIPON.EDL. For software Queries and Replies. Ken Loach, Depanment of Chemistry, SUNY College. Plattsburgh, NY 12901. BitNet address: Loachkw@snyplaba. For Book Reviews. Larry M. Julian , Chemistry Department. Michigan Technological University, Houghton, l\11 49931.lmjulien@mtu.edu. The Committee on Computers in Chemical Education (C.C.C.E. )promotes and publicizes the use of computers in chemical education. The Committee publishes this Newsletter, organizes workshops andsessions at national meetings and promotes and organizes on-line conferences via electronic mail. Some of these activities are described below. Symposium on "Overview of Computer Use in Chemical Education :HighSchool, General, Organic and Analytical Chemistry Courses"
There will be four quarter-day sessions devoted to the above four topics. Each session will consist of two half-hour presentations by invited speakers and a half-hour devoted to questions, discussion and comments. Each invited speaker will describe what software and hardware isused in his or her course. -how it is used - what computer use is required of the student and what is optional - what works well andwhat does not work very well - how the use of computers modified theteaching of the course and the activities of students in the course. This symposium will give teachers who are contemplating introducing more or different computer use in their courses a betteridea of hardware and software requirements, what works well and what doesn't work well, and what successful programs are like. During the half-hour allocated for discussion the two speakers in each session will be available to answer questions or respond to comments. A minute or two will be available during the discussion period forthose in the audience to describe what they are doing at their schools. If any of you readers plan to submil a paper or participate in a poster session at the Biennial Meeting, you might wish to "advertise" your contribution briefly during the discussion. If you are interested in participating in the discussion; please let me know so that I will be sure to call on you. The Committee on Computers in Chemical Education will hold an open meeting during the 1994 Biennial Meeting. If you attend the Biennial, we hope you'll plan to meet with us. Check the program for time and place. Many members of the C.C.C.E. will be present. We'll tell you about some of the things we'redoing and would welcome suggestions and comments from you. The summer 1993 conference is described in an article elsewhere in this Newsletter. During the late spring of 1994 an Open Meeting of the ACS Division of Chemical Education's Executive Committee will be held via LISTSERV. Some of the Division's activities and problems will be discussed and an opportunity will be provided for on-line participants to ask questions and make suggestions. 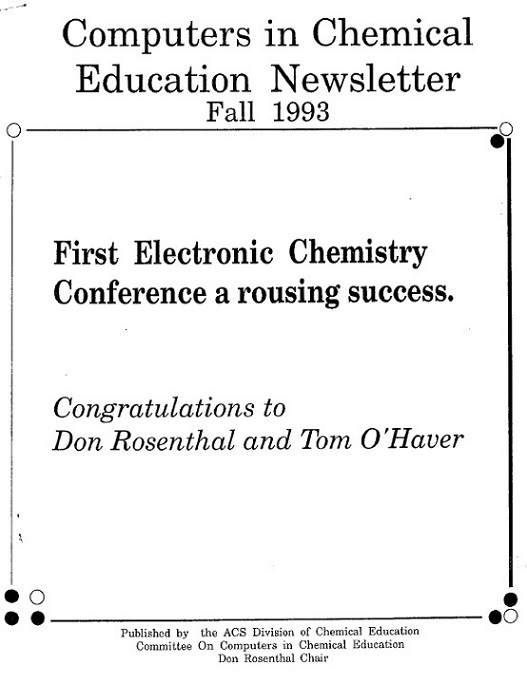 A follow-up session to I he online meeting will be a conventional (non-computer) session held at the 13th Biennial Conference on Chemical Education at Bucknell University in August 1994. Donald E. Jones, 1993 Chair of the Division's Executive Committee, will organize and manage the meeting. (Donald E. Jones, Western Maryland College, Westminster MD 21157 E-maii:DJONES@NSF.GOV). Another Computer Conference will be held during the summer of 1995. It will be sponsored by the Division of Chemical Education, The theme of this conference has not yet been decided. Anyone interested in helping to organize a future computer conference should contact Thomas O'Haver or myself. The Spring 1994 Newsletter will be distributed at the 13th Biennial Meeting at Bucknell University. Anyone wishing to submit an article for publication in this Newsletter should contact Briarr J.Pankuch, editor.